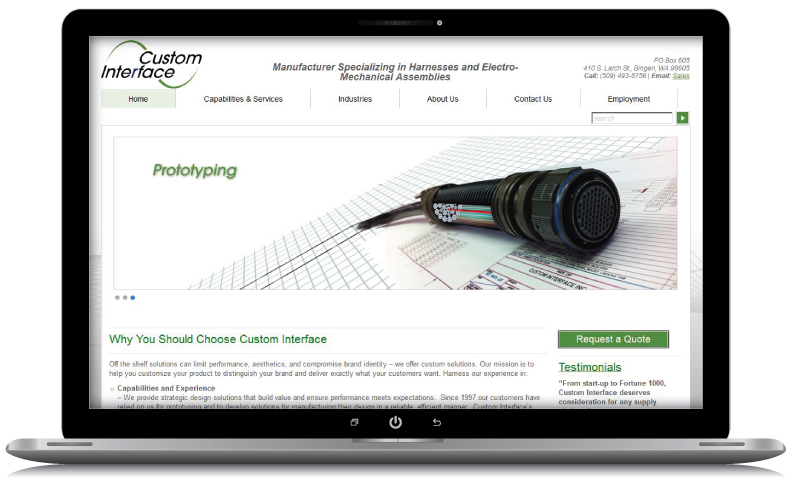 Founded in 1997, Custom Interface Inc. (sister company to Boeing), focuses on creating products for industry leaders in Aerospace, Military & Defense, Industrial Sensing, Renewable Energy, and Transportation definitely warrants, if not demands, a high level signature look to compete on the global stage. In 2013, Custom Interface Inc. partnered with WebRock Design with the task of raising their brand’s visibility and level of professionalism within the industry’s global marketplace. Developing a cohesive marketing and branding strategy, WebRock Design created a new logo, marketing materials and website to successfully deliver a focused message and competitive presence. Custom Interface Inc., which has grown to a multi million dollar company, now has a professional identity that mirrors the high standards of their professional integrity.